Stocked in six of the most popular lengths, 6", 12", 18", 24", 36" and 48"
Count on Clip Strip Corp. to assist you with all your sign hanging needs. We carry many different styles of retail store ceiling sign hanging devices. Browse through our online catalog where you will find point of purchase products to fit many or all of your in store product merchandising and print signage hanging needs. Whether you are communicating through store windows to draw customers inside or once inside you need to direct them to sections of the store or alert them of sales and promotions, use big signage and our sign holders to get your messages across. Minimum quantity for "6" Ceiling Cable with Looped Ends, CBSH-6" is 10. Minimum quantity for "12" Ceiling Cable with Looped Ends, CBSH-12" is 10. Minimum quantity for "18" Ceiling Cable with Looped Ends, CBSH-18" is 10. 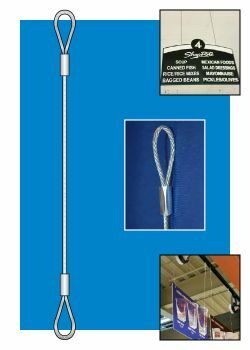 Minimum quantity for "24" Ceiling Cable with Looped Ends, CBSH-24" is 10. Minimum quantity for "36" Ceiling Cable with Looped Ends, CBSH-36" is 10. 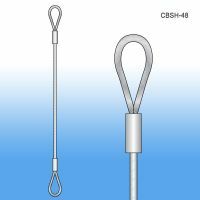 Minimum quantity for "48" Ceiling Cable with Looped Ends, CBSH-48" is 10.